DRYCLEANNY.COM, we offer the valleys finest in drapery, curtain, and valance cleaning. All draperies are pre-measured and beautifully pleated after cleaning. We now offer Drapery Cleaning in your home or office! DRYCLEANNY.COM can now clean any type of window treatment or fabric covering, WHERE THEY HANG, without having to take them to the cleaners. This includes Swags, Balloons, Jabots, Valances, Cornices, Fabric Shades, Verticals, Silhouettes, Duettes, Pleated Shades, and Sun-damaged and Fragile Fabrics. We guarantee no shrinkage, damage or loss of sizing. Did you know that approximately eight out of ten asthmatics are allergic to dust mites? They are so small that nearly 1000 of them can fit on a pin head. The dust mite's favorite breeding and living space is the mattress. They like a moist, dark environment. The Solution - Anti-Dust Mite Treatment. 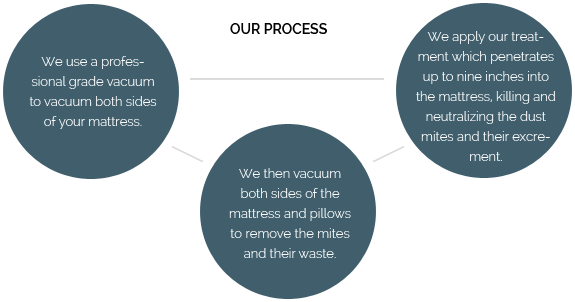 Our special mattress treatment kills dust mites and removes the excrement which causes allergies. We apply it to your mattress, pillows, and bedding. Best of all, it is made from natural sources and is child and pet friendly.